Did you know that the average Canadian household has $300 in unused gift cards lying around the house? Did you also know that 1 out of 4 gift cards are not used within a year of purchase and that many of those will never get used at all? Does this sound like you? I know I have several cards floating around my house/purse that I’ve been storing for quite a while and they may never get used. What a waste. Luckily there is a solution! CardSwap allows you to get money that you can use any way you want for your unused gift cards. Don’t let those unwanted gift cards waste away in your wallet or get lost in your sock drawer. Selling your unused and unwanted gift cards on CardSwap is simple. You can chose to get paid via cheque, paypal or SwapPoints. What are SwapPoints? They are the rewards system on CardSwap that you collect every time you make a transaction. You can then redeem them to purchase the gift cards that you want. I haven’t sold a card on CardSwap just yet but I will be doing that soon as I have a few that I know I will never use but I’m sure there is someone else out there that will. I’m pretty sure I have a $50 Cineplex card collecting dust somewhere and I can’t tell you the last time I actually went to a movie theatre! 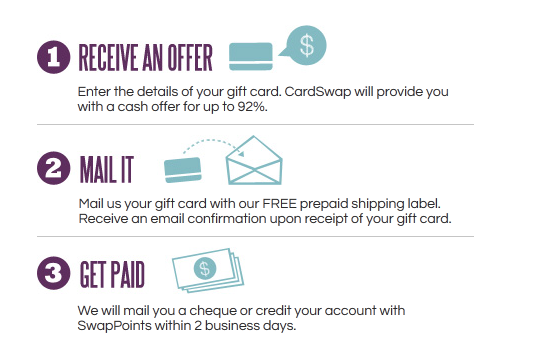 The great thing about CardSwap.ca is even if you may not have any cards to sell you can still buy gift cards and collect valuable SwapPoints. When you are browsing the collection of cards available to purchase you will also see the number of SwapPoints you can earn on each purchase (and keep an eye out for hot deals and bonus points). It doesn’t take long to collect enough points to redeem for cards – 1,000 points = $10. 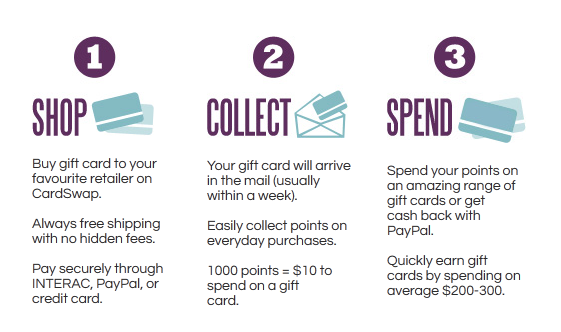 If you are a regular gift card purchaser it just makes sense to buy your cards this way and get rewarded. I was thrilled to receive some SwapPoints in order to purchase a card for this review. I have had an account for some time but if you need to set one up I assure you it is quick and painless. I have mine linked to my Facebook account which makes signing in a breeze and I don’t even have to remember any account name or password. You will find a really good selection of cards to purchase. There are too many vendors to list here but, to name a few, you will find – Sears, Chapters, iTunes, Future Shop, Boston Pizza, and the list goes on and on. And if what you are looking for isn’t in stock you can also add vendors to your wishlist and get notified when the cards you want are in stock. I was happy to see that the card I wanted actually was available. I am a huge Apple fan and have had my eye on Apple TV for a while now. So, when I saw that there were gift cards redeemable at the Apple store available I jumped all over it! The purchasing process was a breeze. I simply picked the card I wanted, verified my shipping address which was already in my account, entered my credit card information (I actually used the opportunity to earn some more SwapPoints by purchasing a larger gift card) and voila – done! You can pay with SwapPoints (if you have them) Interac Online, Credit Card or Paypal. I love that they have so many options (all of them safe and secure) for paying. Shipping is free and my card arrived in about a week. If you haven’t already been there, stop by CardSwap.ca to learn more and see the huge selection of gift cards available. You really should follow them on Facebook and Twitter too as they are always having lots of fun and tons of cool SwapPoint giveaways! I am thrilled to tell you that one luck Mommy Outside reader will win a $40 credit to put towards the gift card of his or her choice at CardSwap! Enter below! Open to residents of Canada 18 and older. One main entry per household only please. Winner will be emailed and must respond within 48 hours. I would choose a chapters card and give it to my son so he could get some new books. He's already finished the divergent/insurgent books I got him for christmas. I'd get the Old Navy card! I would like the Keg Steakhouse gift card. So many to choose from! I think I'd get Sears. I'd love to have Walmart gift card. I would like the Keg card-date night!! I could use an LCBO one right about now! I'd choose the Esso or Bon Appetit one! Canadian Tire or something practical. I like the ROOTs card. I'd love a Sephora gift card. I would buy a Little Caesars gift card. I'd love a Costco card. I would choose Shoppers Drug Mart. I bought an IKEA card from Cardswap on Thursday night and I just received the HBC card that I ordered last week. These are a few of my favourite shops but I would also like a Tim Horton's card. I'd love a Sephora card so that I can indulge in some frivolous spending for a change.